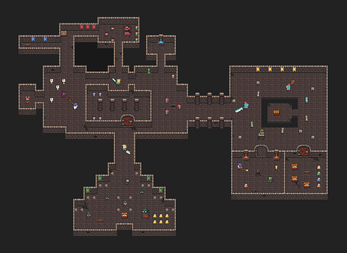 This is a version II of my first dungeon tileset with some major changes and recolored (GrafxKid). You can use this tileset for whatever you like (CC-0). Credit is not necessary, but if you create something using this tileset I'd be happy to see your work (you can comment with a link). added crop.py script (pytohn3) to split the whole thing into separate pngs according to the tiles_list. > You saved the princess from her confines! Unfortunately she died from suffocation whilst in the chest. Thanks for all your amazing assets! I have launched my new game "The Dark One" on kongregate, people loves it so far! It wouldn't be the same without your assets. I'm really grateful! Keep up your great work mate! Wow, it has a story and what not! Congratulations on releasing the game! Unfortunately I'm not able to spend time on this one anymore. I cannot give any concrete advices either not knowing what is your stack; if I knew it there is a high chance I wouldn't be able to anyway. A non-concrete advice then: you could try to do something like storing positions and rotations (or just transformations) of the weapon from the most resent 8 or so frames; than draw it with a diminishing opacity. Draw the actual sword the last (on top of everything else). Maybe instead of opacity you should always draw them with a shader and a plain color of choice (the color of the weapon or white or some fantasy red/blue whatever) - maybe adding glow shader to the mix would help. Finally you can use particle to draw sword trails; from my experience particles in pixel-art looks great if they obej pixel-artness of the game : ) - there are some tutorials available out there, mostly for 3d, but it shouldn't be a blocker. Earlier you wrote that: "Each hero character consist of 9 frames:", but in the zip with individual sprites I found 18, what is the difference between for example elf_m and elf_f? To me it looks like _f doesnt have legs, so what should be its use exactly? Also thanks for being the most complete asset pack on here, great work. elf_f is a different character then elf_m. `_f` is supposed to indicate she's a female. And she does have legs, they are just not visible because she's wearing a long dress... You can actually see her legs when in the `hit` 1-frame "animation". The male wizard's also wearing a dress so I guess it's not a best indicator of gender but I'm having just a couple pixels to work with, don't blame me. > Also thanks for being the most complete asset pack on here, great work. Oh, I did only look at the files on my computer, they were kinda small. Seeing it now again animated on the itch page, makes perfect sense. Thanks. Can someone explain how to use Tileset in a unit? I set SpriteMode = Multiple and in Sprite Editor Slice with Pixel size 16x16 but everything is crooked and I can't use it normally. I'd like to use ur Tileset for my first "solo" project. I have a question. How do i animate the walking animation of the "hero" ? (the green-shirt boy.) Ive tried but it doesn't look that good :/. The frames can have equal duration - 100ms each should work just fine. Those are extremely simple animations; not sure if this is good enough for you. im not planning to make a triple A title and it looks way better than the things i draw. I'll try to upload it when its done. Looking forward to see it! Good luck with your project! Hey! I'm using these textures in a game I'm currently developing and i was wondering how i should give you credit. Should i put your full name (if so what is it), or just a link to your itch.io account? I'm glad my work could be helpful to you! Where can I see your game? I'd love to check it out! Hi, I have recently developed a game using mainly your assets, absolutely love your work. Looks amazing! Difficult, but I'll try to figure it out again in the morning. Nice lighting, kinda small tiles on my phone, or maybe just i have fingers a bit too fat (I guess it'd be better on a tablet). Yes, Im not so good in balancing a gameplay difficulty, I will try to figure it out. Thank You for checking it and feedback, Its realy nice! Hi, this is fantastic! Did you use a specific palette? If so, would you mind sharing? I'm looking to expand the tiles a little for a game I'm making. I just spotted your credit at the top of the description for GrafxKid and I'm guessing it's their Linear Color palette on Lospec. Hey i made my first game using your sprites its short though. Hi, thanks! The email is accurate. I cannot see anything from you (does your email conatin "denisk" string? ), when exactly did you sent it? it was Oct.18. It contains "denis")) I have just re-sent it. Check it out! There is a lot of people saying that your art style is amazing! Its a open source pygame game, so if you would like to check the code its on the game page. These are excellent sprites! Here's what I've been doing with them in Monogame: https://imgur.com/a/ckR7f3v Do you have plans for any updates/additions to the tileset? Thanks for the great tileset! Hey I really love the art style and I would love to use this as a kind of start for my game until I get the hang of actually making 2D pixel art my self I'm just wondering will these work in any engine that has 2D support? So like Unity, Godot, Defold, RPG Maker etc? or can I only use these in certain engines. Hi, I really like your assets, but I think its missing a important thing, puzzle assets, like buttons and levers, could you make some, it would be awesome. Nice I've got to the second level and died almost immediately. I'm not entirely sure what the mechanics is and what should I pay attention as a player - which enemies are how much powerful, how much hp I have and so on. Some explanation/tutorial/visual-clue might help; or... I need to play a couple more games to figure it on my own - who knows? Otherwise: keep up the good work! Otherwise: commercial ads in a school project?! I might consider going back to school if it become not only fun and interesting but also net-positive financially XD. The arts are pretty. I really love it. Can I modify some sprites? I'll put the credits in my game. HI! Awesome art . I would like to use your assets for a scholastic project but I do not understand how to take up arms to the characters on unity. Thank you for any answers! I'm not 100% sure what "take up arms to the characters" mean, but in any case I'm unable to provide any support for Unity, as I know next to nothing about it. Sorry. I love your art, simple yet extremely eye pleasing. Keep it up! Hey, awesome art. Used it for a gamejam. This is what I made: https://twitter.com/AngelRDev/status/1053047341996040192. Would like you to take a look at it. Looks amazing, thanks for the attribution! Any chance for a mac build? Just exported a build for mac. First time I do it, hope it is working, can't check myself haha. Works! Thanks. Short but fun, I like it. Great work! Are you using a font for the "heroes", "demons", "undeads", and "orcs" titles or is that your own drawing? If it's a font, could you share what it is? Thanks! Just registered on itch to say that your art is pretty awesome. I have been wandering around game art assets sites for quite some time and I must say that I have seen very few assets that are as noteworthy as yours, and even fewer that are free and CC0. I have been playing around with your art assets for months, and I have begun to like the perfectness with which they are created (Especially the characters). Your two dungeon assets already have so much assets and combining them with "pixeldudesmaker" gives almost 100s of distinct characters and stuff. Thank you so much for providing such beautiful assets for free :P.
All of your doors are front views (in both the dungeons), can you extend them by adding some side view doors. A small update to pixeldudesmaker, with probably some new clothing items. Thank you, I'm really glad you like it. The side-view doors are something I struggle with for some time already. They just never look much like doors. Obviously I'll have to draw them sooner or later but I keep postponing. Otherwise - all of what you've mentioned is somewhere in my todo-list already*. It's just difficult to find enough time. In any case I'll have some update this month (No promises about what it'll be though). [*] except ceiling - I don't know what you mean - game dungeons have no ceiling - I'm intrigued - can you elaborate? I will eagerly await the updates, surely they are gonna be great, especially the pixel dudes one. As for ceilings, I mean something like this. The ceilings are colored kinda black there, but I meant something similar. 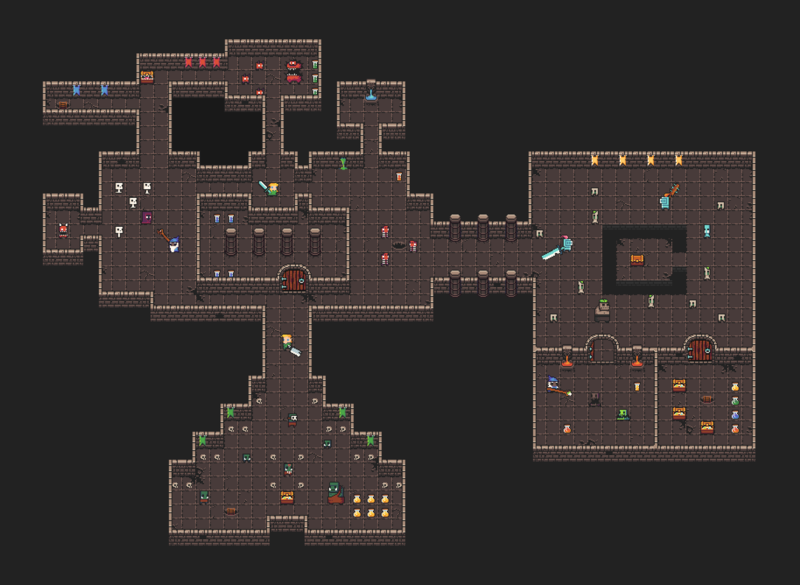 True, I also haven't seen a dungeon with ceilings, so feel free to move this to the bottom of your priorities. I'm new to this, so I might be going about it the wrong way... But how do I use this with Unity? It seems like it would be better if everything was broken down in named folders and individual images, then I could use Texturepacker to import it into unity. Or is there any easier way? Currently it seems I would have to crop out each character that I want to use. Any help would be appreciated, thanks! I have no knowledge of Unity at all but I've just added crop.py script that should help with your problem. Import the sprite sheet by dragging and dropping it into Unity. Then, set the sprite mode to "multiple." Next, edit the sprite inside of unity to set the boundries. There are loads of tutorials on this. That's true, but this sprite sheet has different spacing, different sizes, etc. So if you import into Unity as auto, all the background elements end up as one sprite, and some of the character sprites get lumped together. If you import as a grid, you still get the same issue, characters get cut up, etc. If there's an easy way to fix all that, please let me know! Don't slice on auto - slice on "grid by cell size." There is also an option for padding if there is any. I'd like to piggyback off of this as I'm having the same issue. The sprites seem quite lovely, but the sheet has no consistency to its size, placement, or padding, which makes importing them into many game development engines a nightmare. Anyways - Is uploading the individual pngs in a zip folder out of the question? That would really help us out. There are spacing and placement that suits my workflow. I expect you guys to not like it - this is why I've added tiles_list files - so you can easily reorder/extract/pluck/rename/iterate/remove/add/whatever the items. I thought it's a sensible solution - works with any language. The python script could be considered just an example - I don't see the reason to learn python to use it nor I can see how it would be a bad thing. Honestly I don't understand what the issue is. In any case I've just uploaded a zip file with the output of copy.py. Can you add more enemies or Trap? Trap might be a good idea; will add soon, I don't see a reason for more enemies right now though. Do you have in mind anything particular? Wow! Amazing work. I may use this in my free game soon. Man this is awesome, I love it! Definitely will upgrade Kill Streak to this in my future update!! Wonderful stuff. I wish I could make stuff like this! Keep drawing, you can do this :) I recommend Aseprite.